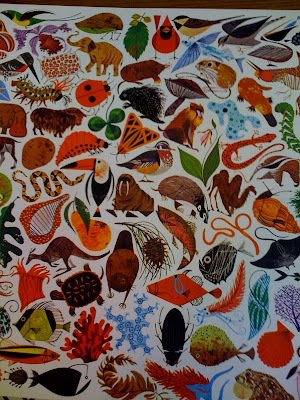 Yesterday I came across an amazing coffee-table type art book of the art and graphic design of Charley Harper! This may be old hat for ya'll but I had never seen his work before but I instantly recognized the style as something I grew up seeing in older design motifs that I have always been very drawn towards. I love the bold graphic design elements and the modernist accents. I particularly love his environmentally-aware subjects and natural history/biology work - especially the ocean themed ones. He stays true to his animal subjects like a naturalist but still manages to imbue the creatures with verve and personality. I love the National Parks posters he did as well. He also did some advertising work and some in-house stuff for Ford that seemed to be focused on Americana and heritage-type subjects. All fantastic. All great stuff. I now have a new holy grail for thrift-store book shopping. If you haven't seen these before take a spin around the website- they are really great. Oh wow, those are truly amazing. I'm going to spend so much time on that site, clicking away, I can tell.